Burger King is offering a little incentive to try/buy the Memphis BBQ Pulled Pork Sandwich with a new, limited-time $4.99 combo including the sandwich, a small order of fries, and a drink. 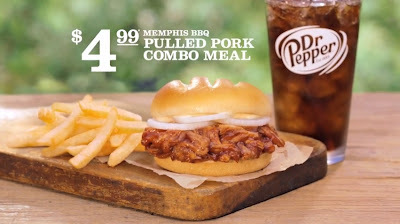 The Memphis BBQ Pulled Pork Sandwich features pulled pork, Sweet Baby Ray’s Sweet BBQ sauce, sliced onions, and Sweet Southern dressing on a toasted artisan-style bun. It carries a suggested retail price of $3.49 (may vary) so you're looking at paying about $1.50 more for fries and a drink. The deal matches the same price point as the King Deals they're offering in some markets. I had one of these combos last week, and I don't really think it was worth it. The sandwich was smaller than I thought it'd be (I honestly can't believe this thing sells for more than $2 on its own), and since you can only get an order of small fries and small drink with it it's not a very filling meal (to me, anyway). A Double Memphis BBQ Burger at Carl's Jr. was around $5 on its own back when they still had them, and I'd say that one burger was more filling than this entire meal was. I hope they bring that back one day.